What Makes Dan Wesson Revolvers Unique? BARREL INTERCHANGEABILITY: Dan Wesson revolvers were designed and manufactured to allow for easy interchange of barrel length and shroud type. Barrels and shrouds were manufactured in lengths from 2” to 15”, in various shroud configurations including Vent Rib and Heavy underlug. Barrels and shrouds are easily changed via a special “barrel nut” that is unscrewed, allowing the shroud to slide off, after which the barrel is unscrewed from the frame. A new barrel is then screwed into the frame, a new shroud slides over the barrel, and the barrel nut is tightened into place. The entire barrel/shroud interchange process takes 1-2 minutes, and is accomplished with the use of a special Barrel Wrench, supplied with each revolver. 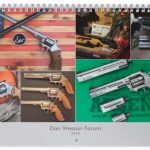 ACCURACY: The Dan Wesson barrel/shroud design is inherently very accurate. In effect, the barrel is tensioned equally at the muzzle and frame, and free floats in the shroud. The barrel is less affected by heat expansion, and is essentially secured between two points (similar to a fine stringed musical instrument) rather than just one point, at the frame. This tensioned design keeps the muzzle more rigidly aligned with the frame/cylinder, resulting in more consistent accuracy. 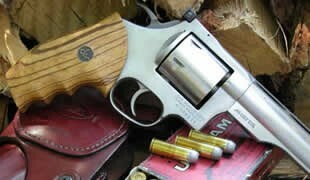 The cylinder latch on a Dan Wesson revolver is located on the cylinder crane, at the front of the cylinder. This allows the cylinder to be more precisely aligned with the barrel than is possible with the more common practice of locking the cylinder into the frame at the rear of the cylinder. Dan Wesson revolvers consistently have a very smooth action, with a light, crisp trigger break in both single and double action. MODULAR DESIGN: The design of the Dan Wesson revolver allows for a greater flexibility than any other revolver. 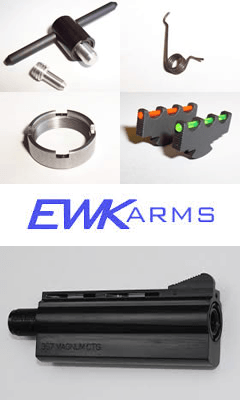 In addition to the easy interchange of barrel/shroud combinations, the front sights are available in multi color inserts and configurations, again easily and quickly changed with the tool provided. 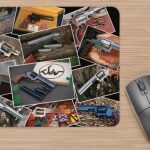 It is possible with a Dan Wesson revolver to change the grip configuration rapidly, and the selection of grip styles ranges from Target, Combat, and Presentation in both wood and rubber in many sizes. 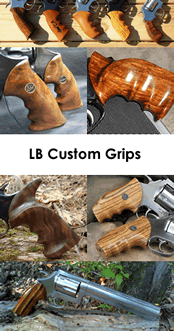 Inletted wood “blanks” are available to allow the shooter to craft a custom grip. CALIBER: The modular design of Dan Wesson revolvers allows for the availability of a wide range of calibers. Two basic frame styles are available and the “Small Frame” and “Large Frame” revolvers accommodate cartridges from .22 Long Rifle through .460 Rowland. 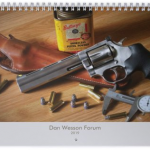 The flexibility and strength of the Dan Wesson platform was instrumental in the development of the legendary SuperMag cartridges by Elgin Gates, and Dan Wesson revolvers are considered to be the perfect revolver for accurate long range and Silhouette shooting. 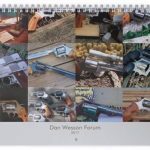 PISTOL PACKS: Dan Wesson revolvers were sold as individual handguns, and in Pistol Packs. The Pistol Pack consisted of a Dan Wesson revolver sold in a specially fitted “brief case” along with several barrel/shroud assemblies, additional grips, colored front sight options, and special premiums (embroidered patches, belt buckles, etc.). Additional barrel/shrouds, grips, and sights were readily available from the factory, and aftermarket manufacturers (Millet, Pachmayr, and Hogue to name a few) had/have readily available accessories. Dan Wesson revolvers are legendary for quality craftsmanship, and blue versions are particularly noted for a deep “mirror-like” finish. 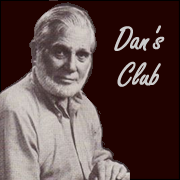 The Dan Wesson story embodies the Golden Age of American Firearms development and manufacture, and is the epitome of American manufacturing innovation and excellence.